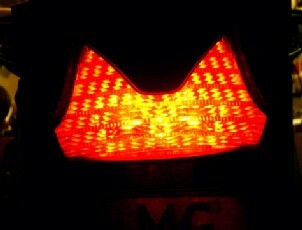 The taillights of some bikes are too weak. Unfortunately the 1300 is one of them. In bad weather the 1300 can hardly be seen from behind. 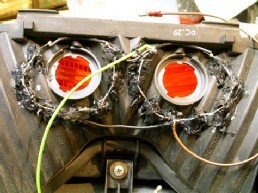 This problem can be solved by mounting extra powerLED's in the taillightunit. Four powerleds in series can be connected to 12V and generate a lot of extra light at the back of you bike. 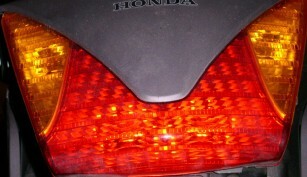 I mounted 16 extra powerleds around the existing taillightbulbs to improve visibility from behind. 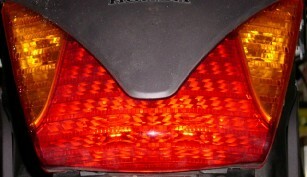 To do this you first have to take off the taillight unit from the bike. Then drill 16 5mm holes around each bulb in the reflector, as straght as possible directed to the rear. After that you glue in the LED's and connect them in series of four. 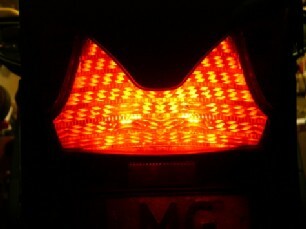 When done this please kit the LED's with a first layer of white acylate kit (for reflection) and then with a black layer to prevent shining through. At least you have to connect each series of four to the 12V from the existing taillights.